Approximately 8% of all non-Hodgkin lymphomas are extranodal marginal zone B-cell lymphomas of mucosa-associated lymphoid tissue, also known as MALT lymphomas. MALT lymphomas arise at several different extranodal sites, with the highest frequency in the stomach, followed by the lung, ocular adnexa and thyroid, and with a low percentage in the small intestine. Interestingly, at least three different, apparently site-specific, chromosomal translocations and missense and frameshift mutations, all affecting the NF-κB signal pathway-related genes, have been implicated in the development and progression of MALT lymphoma. However, these genetic abnormalities alone are not sufficient for malignant transformation. There is now increasing evidence suggesting that the oncogenic product of translocation cooperates with immunological stimulation in oncogenesis, i.e. the association with chronic bacterial or autoaggressive infections. 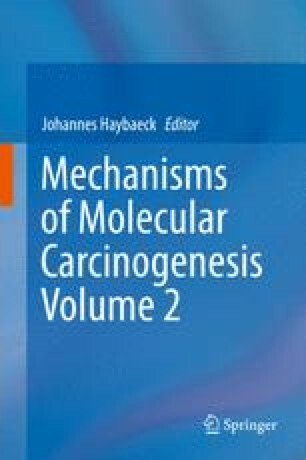 This chapter mainly discusses the genetic aberration and the association with chronic infections of MALT lymphomas and summarizes recent advances in the molecular pathogenesis and therapeutic advances of MALT lymphoma.